- Make the holidays magical! Such a lovely bit of fantasy art is sure to appeal to anyone on your Christmas card list. This graceful fairy is doing her part to get everyone in a holiday mood by conjuring up some snowflakes for a winter wonderland. 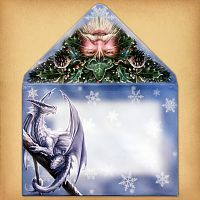 Open the Christmas card, and you'll find more fanciful holiday art— a guardian dragon curled around a candle, with the words "Yuletide Greetings" above, surrounded by that same phrase in several other languages. 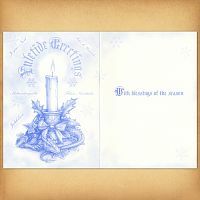 The facing page reads, "With blessings of the season". Add your own message if you wish. Then slip the Christmas card into the coordinating envelope, and send it on its way. These earth-friendly cards are printed on recycled paper using vegetable oil based inks. Cards are sold individually, wrapped in protective cellophane. They measure 6 3/4" by 4 3/4". This card is based on a work by the English artist Anne Stokes. Anne specializes in bringing fantasy subjects to life, whether they be fairies, dragons, unicorns, or completely new creatures drawn from her own imagination. The holidays are over, but the card is too pretty to throw away! Keep it! Find an inexpensive 5" x 7" frame, and slide it in. This Christmas card will make a gorgeous mini-poster when you deck the halls next year. 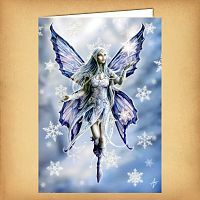 Do you have any other questions about our Snowflake Fairy Christmas Card? Beautiful artwork by Anne Stokes, perfectly printed in this card. I personally enjoy the fact that there is a lot of space to write stuff inside. Fantastic art work and colors. A wonderful card to send to all your fantasy lovers for the holidays. Would have liked a bit more printed greeting inside but there is space to write one's own.